As a Utility Owner-Member, WSSC is partnering with Miss Utility to remind everyone of the importance of calling before digging to mark all underground utility lines to prevent unnecessary damage. It is the national number to help protect homeowners and professional excavators from unintentionally hitting underground utility lines while working on digging projects of any size. and potentially incur fines and repair costs. Before any digging project - you or your contractor should call at least 2 full business days prior to the start of the work in Maryland. Calling 811 at least 2 full business days prior to digging starts the process of getting underground utility lines marked for free. notify affected utility companies who will send out a professional locator to the proposed dig site to mark the approximate location of the lines. When the underground lines have been marked, you will know the approximate location of your utility lines and can dig safely. What happens if I don't call? 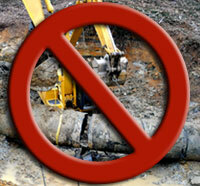 Approximately 170,000 underground utilities are damaged each year by digging. One out of every three incidents is caused by someone who did not call 811 before digging. Knowing approximately where underground utility lines are buried before each digging project helps to prevent these situations. Are there penalties for violating the Miss Utility Law? There is a Maryland Underground Facilities Damage Prevention Authority that has been established to enforce the Miss Utility Law. SAFE DIGGING IS NO ACCIDENT, BEFORE YOUR SHOVEL HITS THE GROUND, CONTACT THE MISS UTILITY CALL CENTER.